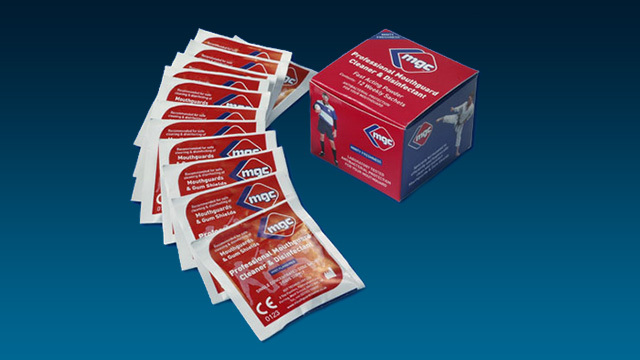 MGC™, a specially formulated, efficient and hygienic professional Cleaner and Disinfectant specifically for Mouthguards. NOT just a cleaner, MGC™ is also an effective disinfectant against; candida albicans (oral thrush), actinomyces viscosus, streptococcus mutans and streptococcus pyogenes. Pathogens commonly found on removable oral appliances. MGC™ has been specially formulated in a fast acting powder form, reducing the chance of delamination of multilayer Mouthguards. MGC™ is economically packaged in 12 weekly sachets. The prepared MGC™ solution remains active for up to 7 days, for multi-use. Click here to purchase MGC from our denture products shop.